One game I remember so fondly is Cinemaware's fantastic medieval game ' Defender of the Crown ' from 1986. It was released for multiple systems including the Amiga, DOS, NES, Atari ST, Amstrad CPC, C64, Macintosh and the Apple IIGS in 1988 with a CD-i version much later on. 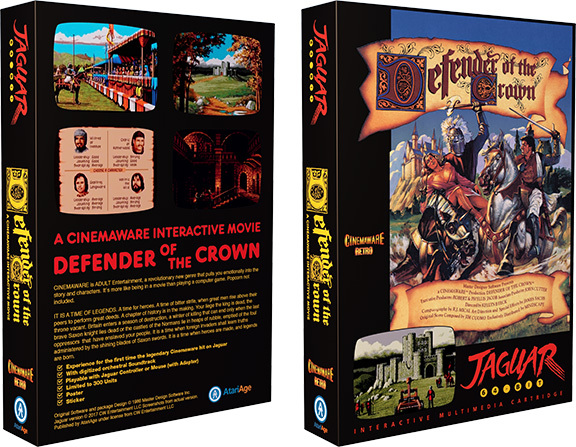 A grand game for its time and loved by all, is going to make an appearance on another retro system, as we've just learnt Defender of the Crown will be coming to the Atari Jaguar! Defender of the Crown Pre-Order! Defender of the Crown includes a professionally printed, full-color box, a full-color manual, game cartridge, poster and sticker.